Chapter 1: Synthetic Aspects of Peptide- and Protein-Polymer Conjugates in the Post-click Era. Biomacromolecules offer complex and precise functions embedded in their monomer sequence like enzymatic activity or specific interactions towards other molecules. Their informational content and capability to organize in higher ordered structures is superior to synthetic molecules. In comparison, synthetic polymers are easy to access even in higher production scales and they are chemically more diverse. Solubilization, shielding against enzymatic degradation to more advanced functions like switchability or protein mimicry etc. are accessible through the world polymer chemistry. 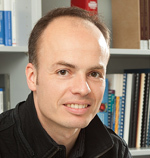 Bio-inspired hybrid materials combining peptides or proteins with synthetic polymers thereby merge properties of both molecules to give rise to a new class of materials with unique characteristics and performance. To obtain well-defined bioconjugate materials, high yielding and site-specific as well as biorthogonal ligation techniques are mandatory. Since the first attempts of protein PEGylation in the 1970’s and the concept of “click” chemistry arising in 2001, continuous progress in the field of peptide- and protein-polymer conjugate preparation was gained. Herein we provide an overview on ligation techniques to prepare functional bioconjugates published in the last decade, also referred to as “post-click” methods. 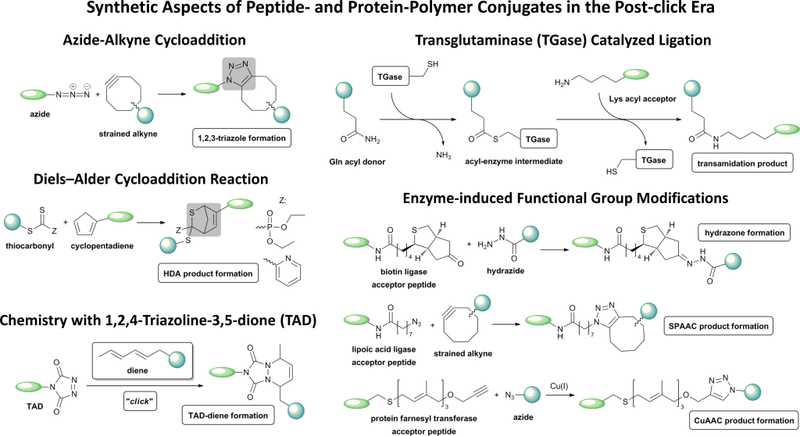 Furthermore, chemoenzymatic approaches and biotransformation reactions used in peptide or protein modification, as well as highly site-specific and efficient reactions originated in synthetic macromolecular chemistry, which could potentially be adapted for bioconjugation, are presented. Therefore, future perspectives for the preparation and application of bioconjugates at the interface between biology and synthetic materials are given.